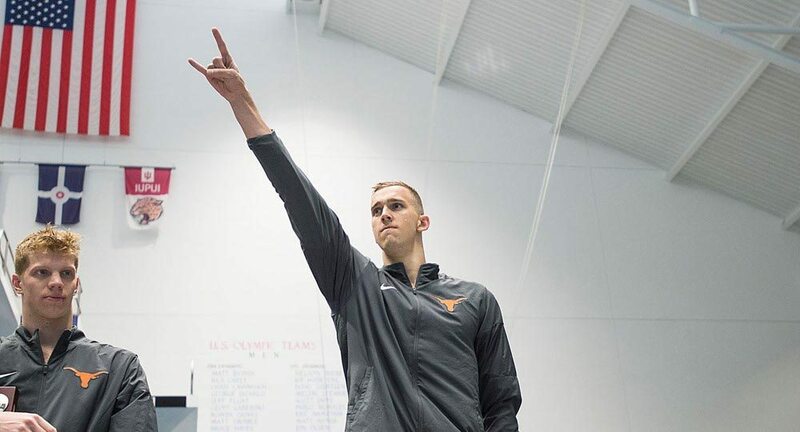 Senior Clark Smith set new NCAA, American, U.S. Open and NCAA Championship records when he won the 1,650-yard freestyle to help the Texas men's swimming and diving team win its third consecutive NCAA title (photo courtesy of texassports.com). Indianapolis — An argument can be made that the University of Texas men’s swimming and diving team is the best of all time. What is not up for debate is that UT is the nation’s premier team this season after the Longhorns won their third straight national championship Saturday in Indianapolis. The title is the team’s 13th all time, moving UT ahead of Michigan for the most ever won by a single school. The Longhorns won four of seven events Saturday — setting an NCAA record in each one — to tie their own NCAA record with victories in 11 of the meet’s 21 events. Texas essentially lapped the field with 542 points. California finished second, with 349 points, followed by third-place Florida with 294.5 points, fourth-place North Carolina State with 272.5 and fifth-place Stanford, which finished with 242 points. Texas head coach Eddie Reese was named College Swimming Coaches Association of America (CSCAA) Coach of the Year for the third straight year. All 13 NCAA titles in Texas history have come during Reese’s tenure in Austin, and this year’s championship makes him the only coach in the history of college swimming to win titles in four decades. Over the course of the four-day meet, UT swimmers set seven NCAA records and three American records. Senior Clark Smith started the night by holding off strong challenges from three other swimmers to win the 1,650 freestyle in 14:22.41. In the process, he established new NCAA, American, U.S. Open and NCAA Championship meet records. He now holds American records in the 500, 1,000 and 1,650-yard freestyle events and finishes his UT career with two additional NCAA titles in the 500 freestyle and a national championship in the 800 freestyle relay from a year ago. Junior Jonathan Roberts broke the 14-year-old school record in the 200-yard backstroke when he finished in 1:39.16, only to have teammate John Shebat break it again about five minutes later, when he finished 1:38.67 en route to a second-place finish in the event. Senior Will Licon became the first UT swimmer to win three individual events at an NCAA Championship meet. Having already won the 200 individual medialy and 100 breaststroke, he completed the trifecta when he claimed his third straight NCAA title in the 200 breaststroke. His winning time of 1:47.91 broke his own NCAA, American, U.S. Open and NCAA Championship meet records. Senior Jack Conger gave his team its third consecutive NCAA title in the 200 butterfly in a winning time of 1:37.35, which was enough to establish new NCAA, NCAA Championship meet, American and U.S. Open records. UT ended the meet by setting NCAA, NCAA Championship meet and U.S. Open records in the 400 freestyle relay, with Ringgold, Conger, Haas and Joseph Schooling winning the event in 2:45.39 and breaking the NCAA and U.S. Open records in the process.